ClassClock helps everyone be more organized. ClassClock is an easy way to get an at-a-glance view of your school's schedule so you can make the most of your time. Students can use ClassClock to answer the common questions such as "What class do I have next?" and "When does lunch end?" allowing students to make better use of their time. Teachers can use ClassClock to keep an eye on how much time is left in class, allowing them to pace their lessons and ensuring that students have enough time to ask questions. 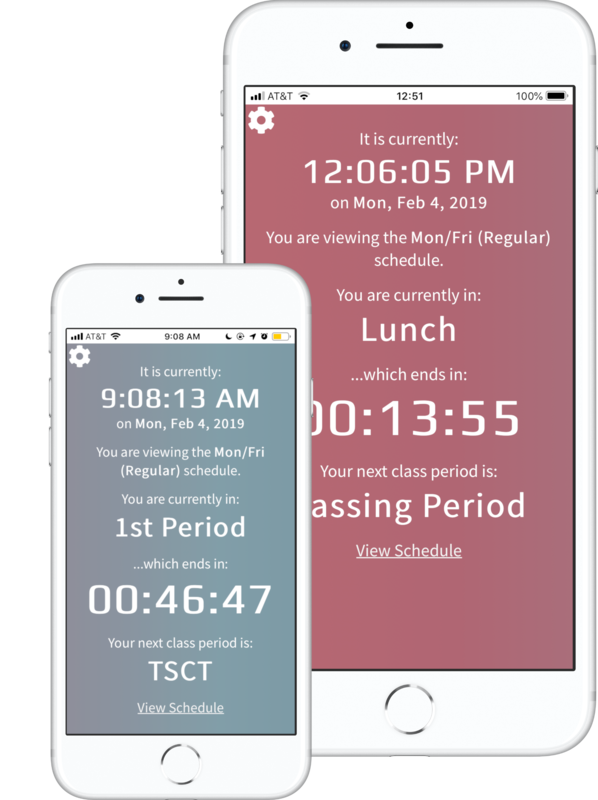 ClassClock also helps give parents quick and easy access to school schedules so they can spend less time looking up when lunch is and more time supporting their students. ClassClock provides school administrators with the tools needed to easily update, and distribute schedules to the entire school community at once. Loaded With Features To Make Scheduling Easier. ClassClock is being designed from the ground up to help schools more efficiently manage and distribute schedules. Here's a look at just a few of it's features. We are constantly working to improve ClassClock. Let us know what you think on social media and be part of the future of ClassClock! ClassClock is still being developed. If you are interested in using ClassClock at your school, you can sign up below to be notified as soon as it's ready. If your school has been selected to help test ClassClock, you can access the app at https://web.classclock.app or even learn how to save it to your home screen for easy access. ClassClock is distributed as Free Software. Anyone is welcome to use, study, share, and/or help improve ClassClock.